Over the last few years, I've spent a lot of time colouring in. Although I've always enjoyed it, having children was a great excuse to stock up on crayons and pens, and invest in a colouring book or two. Fortunately both children love it too, and while they received plenty of gifts for Christmas, the runaway favourite gift was a Frozen colouring book. It was given to Mia, Harry loved it too, I joined in, and it was completed in a week or two. I really enjoy colouring in, it's so relaxing, and because the children love it too it's a great way for us to spend some quiet time together. 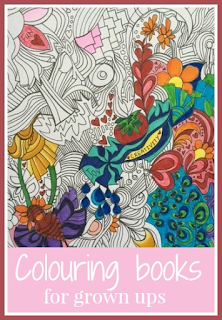 On my various social media channels I had spotted references to grown up colouring books, so I decided to investigate further and was really surprised and excited to see that there are so many colouring books around that are aimed at adults! I didn't know where to start, so I chose one that looked cheerful and fun - Feel Good Colouring: Illustrated with Love by Nadine Staaf. This book doesn't have many recognisable images in it, much of the book is swirly and geometric patterns, interspersed with positive words and phrases. Sometimes though you can pick out your own pictures from the patterns. One page clearly depicts a boat sailing in the sea, and there are flowers and insects. It has loads of pages, and I feel like I've barely started, it's going to keep me busy for ages! It is of course much nicer to do the colouring if you have your own set of decent felt tip pens. But as I tend to do my colouring while I'm sitting with the children I just use theirs, and they love that I'm sitting down doing colouring with them. There are loads of grown up colouring books around! Here are some of the ones that I have my eye on! Do you enjoy colouring? Thank you SO much for featuring my book on your blog! I hope you do much more colouring :) Planning to release book #2 in April 2015! What to do with old diaries?